Just this past week the Sea Shepard Conservation Society Steve Irwin 77 pictured above was in Pago Pago harbor. 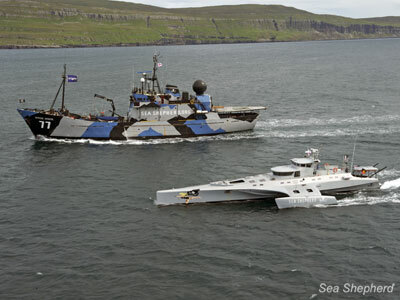 Today the Sea Shepard Conservation Society's 33 meter power trimaran Brigitte Bardot arrived as well. Today Sea Shepard Conservation Society's 33 meter Brigitte Bardot enters Pago Pago Harbor, American Samoa. Listening on vhf channel 16 the harbor master called the Brigitte Bardot and asked why he should welcome the ship into the harbor while the Brigitte Bardot was flying the pirate flag. The skipper of the Brigitte Bardot responded that the flag was not meant to cause disrespect and would be taken down immediately. Sort of a funny radio conversation . Having met and chatted with the harbor master I can say he is really cool. Perhaps we'll get a chance to meet some of the crew this week.and inquire about a tour of the 33 meter power tri Brigitte Bardot.